When it comes to parties at the beach or river, you can’t go wrong when you have good company, music, food, and drinks. 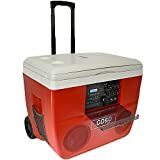 A good cooler with speakers combines three of these things into a portable party machine that is sure to turn heads and to set the atmosphere for a great day out. With lots of choices on the market, it can be hard to find a cooler with speakers that can handle getting wet and still deliver great sound with a battery lasts an entire day. In this article, we look at the best radios coolers on the market and discover that your choice largely comes down to cost and what you’re prepared to pay. When it comes to this type of cooler, your choices generally fall into one of two categories. The higher cost units tend to have much louder capabilities and can be floated in a river, lake or pool while you party. The low-cost units can also produce decent noise but focus more on keeping the contents cool and the ability to store the cooler (relatively) flat when you’re finished using them. Prices range from as low as 30 dollars, and right up to 3 or 4 hundred dollars for the top of the line coolers. **Below, you’ll find our more detailed reviews, but you can also click the links above to see current prices or read customer reviews. As a low-cost cooler with speakers, you’ll be quite surprised by the sound output of this soft-sided cooler. The two 15 watt speakers and subwoofer can crank out volume all day long with a battery life of more than 8 hours. Plug the battery into the wall until the red light goes out and you’re ready for your next outdoor party. Connect your iPhone or Android phone using Bluetooth. Your phone and other devices can also be connected using the 3.5mm cable. If your phone starts to run out of power, you can also use the battery to recharge through the included USB port. The volume and sound quality are controlled entirely by your attached device as the unit doesn’t have any volume controls etc built-in. When the cooler is empty, it weighs less than 3 lbs and is 14.9″ x 12.2″ and 13.7″ high. When it’s full, it can hold twelve 12-ounce cans and still have room to add ice to keep things cool. Our Verdict: This is the perfect gift for a bachelor or bachelorette party. 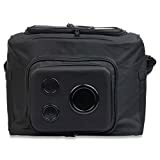 It’s an low cost cooler with speakers that are water resistant and a cooler that portable enough to take everywhere you go. This ice chest with speakers is one of the top-of-the-range options. The company that makes it specializes in good sound – and the cooler won’t disappoint. Not only does it include decent high power speakers, but it also includes an AM/FM radio, a remote control and multiple input plugs and sockets. If you don’t want to use the built-in radio, you can connect your phone using Bluetooth or a 3.5mm cable. Additional sockets are provided to play music from a USB or SD memory card. Finally, you can plug an electric guitar and microphone into the radio cooler to play live music or as a good quality PA system. When it comes to sound, this cooler with speakers has two 6.5″ water resistant speakers and another two 2″ high-performance tweeters. The sound can be heard clearly down the beach or across the campground. You will probably have to turn things down to make sure you don’t annoy the neighbors. The radio cooler can hold 40 quarts. That means it can hold 48 cans or 28 beer bottle and still have room for ice. The insulation has the ability to keep the ice frozen for around 3 days and the inside measurements are 21.5″ x 10″ x 14″ high. Because of its size, you’ll quickly appreciate the large handles and heavy-duty wheels that make it easy to move this cooler on rough ground or sand. A full battery charge will last around 16 hours. If your phone is running low on battery, you can charge it using the USB port. This even works if you are using your phone to supply music at the same time. but well worth the expense. When you’re not using the Budweiser cooler with speakers, it conveniently collapses so you can throw it into a suitcase or store it laying flat on a shelf. The Budweiser name is printed across the front of the cooler and you can buy the cooler in either a red or blue color. As one of our lowest price options, you get a simple pair of speakers that can connect to your phone using Bluetooth or a 3.5mm cable. The battery is stored in the front velcro pocket and has a plastic on/off switch. Once the battery is charged, it will keep the speakers working for about 6 hours. As far as storage is concerned, the cooler can hold 24 cans (Budweiser) and have room for ice. The manufacturer recommends that you use an ice pack instead of loose ice. The cooler is not waterproof and will leak water as the ice melts. This is an outdoor cooler and you need to be careful not to put the cooler on your good carpet unless you are happy with it getting wet. Our Verdict: Because the cooler is branded with the Budweiser name, you should be able to get this at a really good price. Click the "View on Amazon" button for a nice surprise. Another large hard shell cooler with speakers. However, this one doesn’t have a radio built-in. It also doesn’t have rechargeable batteries! Instead of using rechargeable batteries, this large 54-quart ice chest with speakers uses 4 AA size batteries. The batteries need to be installed into the amp at the rear of the cooler before you will be able to hear any sound. A typical set of batteries last for between 24 and 35 hours before they need to be replaced. Batteries are not included when you buy the cooler, so make sure you add them to your shopping list. You can connect your iPhone or Android device using Bluetooth from up to 35 feet away. If you don’t have Bluetooth capabilities, you can connect any other device using the auxiliary 3.5mm cable. A small shelf is provided to store the music device. Two high-powered speakers provide fairly good sound. They are water resistant – but not waterproof. Our Verdict: The need to replace batteries every 24 to 35 hours can be a bit annoying. If you intend to use the cooler a lot, invest in a good set of rechargeable AA batteries and factor the cost of batteries into your purchase. 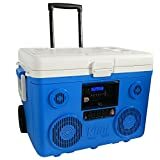 This 52-quart cooler with speakers can hold 60 cans or 35 beer bottles. When you add ice, the cooler will keep the contents cold for about 16 hours. From an entertainment point of view, it comes with everything you need except an FM/AM radio. You can connect your devices using Bluetooth or auxiliary cables. Inputs have also been provided to play music from USB and SD memory cards, as well as CDs. Once the battery has been charged, the manufacturer boasts the cooler has 3 days of playing time. Other users have found that turning the volume right up decreases the overall battery life, and a more realistic playing time is around 20 to 30 hours. This is not really a problem because the cooler can be recharged from a wall socket or a car cigarette lighter socket. We really like the fact the speakers are completely waterproof. This means you can float the cooler in a river or pool without worrying about speaker damage. And at 300 watts of power, you’ll be able to hear the sound through the entire valley. An iPad or phone can be stored in the lid area, along with the remote control for the sound system. Because the lid for the storage panel is not very thick and covers most of the top area, you can’t sit on the cooler and use it as a chair like many of the competitors. When you’re not at the beach, the wireless mic (no cables) and an iPad can make for an excellent Karaoke machine. Big wheels and a telescoping handle make it easy to move around on dirt trails or long grass. Our Verdict: A good top-of-the-line cooler with speakers. This one doesn’t have an AM/FM radio. If that’s not important to you, you can save money when compared to the TUNES2GO cooler. While most people will use their phone or tablet as a music source, there are plenty of other options you might like to consider. These days, almost every cooler with speakers can connect to your mobile devices using Bluetooth or a 3.5mm plug. Less expensive coolers typically have 15 or 20-watt speakers. They are normally powered by a small amp located somewhere in the housing of the cooler. Top end coolers with speakers have high-quality amps, subwoofer speakers and tweeter speakers. It’s not unusual to see top end radio coolers having enough power to output 300 watts or more of sound. Almost all of the units we reviewed use rechargeable batteries. Even though rechargeable units are slightly more expensive, they will save you significantly in the long run. Battery life is also a factor you’ll want to take into account. You need a battery that can last at least 8 hours. Some of the top end models have batteries that can last several days between charges. Even though the cooler may not float, you definitely want a cooler that is water resistant or waterproof. Without a doubt, you’re going to take the cooler to the beach, lake or a river. You don’t want to spend your money without knowing it can survive a downpour or a decent water splash. Some of the best coolers allow you to literally float the cooler as you sit in your pool or on a rubber ring in the river. Keep in mind that while the cooler and speakers may be waterproof, the lid or storage areas may not be. So don’t put your valuable iPad or phone into the unit unless you’re sure it will stay dry. You can make life easier when you have your next party by using a cooler with speakers. Not only do you keep your drinks cool, but you can also liven up the party with top quality music from any of your mobile devices. If you’re on a budget, you can’t look past the Super Real Business 15-Watt Cooler. 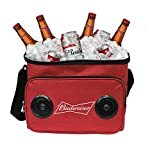 If you’re OK with Budweiser branding, the Budweiser Soft Cooler Bag is an absolute steal and less than half the price. We personally like the TUNES2GO Cooler the best. We love the 350-watt speakers and the fact it has an AM/FM radio to go with all the other input sockets and memory slots. If you have an electric guitar, the independent mic and guitar volume controls make this the best cooler with speakers we’ve seen.